The Oasis centre is in Boston Spa, near Wetherby, West Yorkshire. We are based in Hall Mews, a converted stable block. It provides a comfortable environment in quiet surroundings, conducive to development and learning. Boston Spa is just off the A1, within easy driving distance of York, Harrogate and Leeds. It is a short distance from York, Leeds or Harrogate railway stations, and from Leeds-Bradford Airport. Boston Spa lies on the A659 between the A1 Junction 45 Boston Spa/Collingham and the A64 Tadcaster junction. In the centre of the village, turn off High Street (A659) into Clifford Road. Hall Mews is the third turning off Clifford Road on the left. After 50 yards turn into the first car park on the left, go through the gap in the wall into the main area. 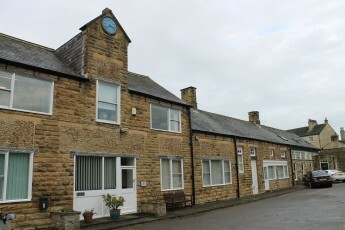 The Oasis offices are in the stone stable block to the left. The entrance is under the clock tower. The 770 bus service from Leeds to Harrogate takes about 45 minutes to reach Boston Spa. Get off at St Mary’s Church and walk in the same direction as the bus. You will pass the Village Hall on your left and see Boston Hall on your right about 50 yards further on. Go through the single green gate and follow the path down the side of Boston Hall. You will find Oasis under the clock tower. The 843 (Coastliner) bus departs from York Rail Station and takes 45 minutes to reach Tadcaster Bus Station. Once in Tadcaster catch the hourly 780 service to Boston Spa (alternatively get a taxi at the rank by the bus station). Get off outside the pharmacist in Boston Spa and walk in the opposite direction to the bus. You will pass the Village Hall on your left and see Boston Hall on your right about 50 yards further on. The bus from Harrogate and Wetherby is the 770 to Leeds. It takes about 15 minutes to reach Boston Spa from Wetherby and about 45 minutes from Harrogate. Get off at the stop on Bridge Road, walk up to the High Street and turn left. You will pass the Village Hall on your left and see Boston Hall on your right about 50 yards further on.